Insurance for Taxi Drivers – Quotes & Coverage 7 Day Per Week! If you are looking for a better deal on Insurance for Taxi Drivers you have found the right website! Pathway Insurance is a leading Independent Insurance Agency offering Commercial Auto Insurance for Taxi Drivers throughout the US directly and via our referral partner network. Need coverage for a single vehicle or Fleet coverage? Not a problem. Have a few tickets or accidents or claims on your record? No problem. Are you a brand new company? Not a problem. We can insure virtually any type of Livery account. Call us today or click one of the above links if you reach our office after normal hours. If I Drive for Uber or Any Rideshare Service Do I Need Taxi Insurance? Yes you do! If you are driving for Uber or any type of rideshare service you need a commercial auto insurance policy to properly cover your exposure. Any type of commercial activities you are engaged in while using your personal automobile is excluded under the personal auto insurance policy with insurance companies. Don’t take the chance of assuming your personal automobile policy will cover a claim or accident when providing rideshare services, because it will not! 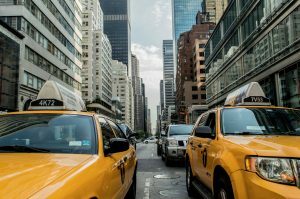 Taxi Insurance – What Coverage Is Available? Contact Pathway Insurance Today When You Need Insurance for Taxi Drivers! Most of our competitors keep banker’s hours but we are available 5 days per week by phone and 7 days per week via our online agents. We are definitely ready to serve your insurance needs!